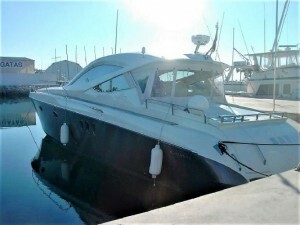 This one owner since new Numarine 55 Hard Top is powered by Caterpillar C12 X 715cv has been well cared for as a family boat around Valencia coastal waters, she is EU VAT and Spanish taxes paid and benefits from bi-weekly cleaning services by specialist marine cleaners. Impeccable maintenance, continuous improvements, annual antifouling services and engines serviced (last July 2017). The cruising-oriented HT benefits from a third double cabin and en-suite heads.